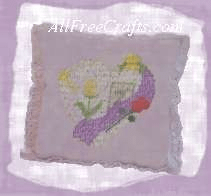 Want to make a pretty pillow that looks like you spent hours cross-stitching? Learn to paint stitch! If you wish to make your own pillow, take two square pieces of fabric (not white) and place the squares right side together. Sew along three sides, with a 1/2 inch seam, and leave the last side open for turning. Turn right sides out and stuff the pillow. Hand stitch the opening closed. If you wish to add tassel lace or another kind of lace embellishment, pin the lace around the edge of one square of fabric, on the right side. Position the lace so that the finished straight edge of the lace is just inside the 1/2″ seam line and the end of the lace faces inwards. When you stitch the two pieces together, stitch just inside the 1/2″ seam line to catch the lace edge inside the seam. When you turn the right sides out, the lace should frame the entire pillow. Stuff the pillow and hand stitch the opening closed. Now you are ready to paint stitch. Print out the free pattern. Place the pattern in the center of your pillow and mark with transfer paper, using a different letter for each color of square, so that you know where to place the different colors of paint. Take a paint tube and shake down paint into the nozzle. Do a sample on a piece of paper towel. Just put a dot of paint on each letter. Let the pattern dry – and when it is finished it will look like you have spent hours cross stitching. Enjoy!